Cover cookie sheet with foil. 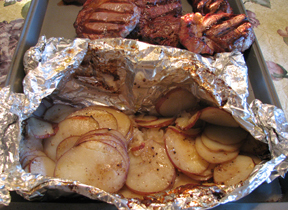 Cut potatoes in half, then cut halves in half (ensure that the potatoes are a similar size). Lightly coat potatoes with olive oil. Sprinkle Kosher salt, red pepper flakes, and steak seasoning on potatoes. Cut bacon into bite size pieces and put on top of potatoes. Put potatoes in oven for 30 minutes, then flip potatoes. 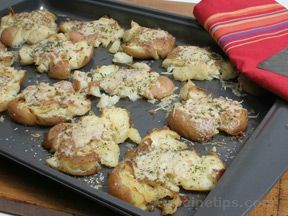 Cook potatoes in oven for an additional 30 minutes or until done. 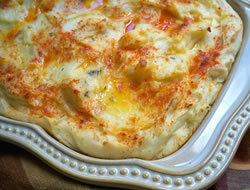 Pour cheese on top of potatoes and put back in oven for additional 2 minutes or until cheese is completely melted.